 Public Lab: Thermal flashlight -- now with more LEDz! 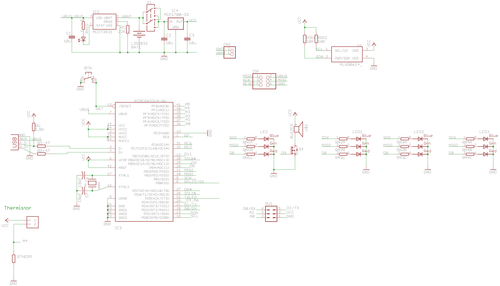 I'm trying to generate a circuit board design for Public Lab's thermal flashlight project. If this isn't sufficiently bright, we might consider having a ring of LEDs around the entire board, perhaps? I'm still learning Eagle, and this is my first attempt at adding what is called a 'ground plane' -- which makes routing easier, and generally helps to smooth out electronic noise in the system. I'm going to look over the design files on github, see if I've goofed anything up, and then aim to order a test batch. If anyone out there knows Eagle and can review the design for any obvious flaws -- or has suggestions for improvement -- please do chime in! I want to see if I can make a prototype before SNOWFEST so that we can see exactly how effective igloos are as insulation against the Vermont weather. It's going to be 40° F on Thursday, Friday, and Saturday, so if you want to collect environmental data inside the SNOWFEST igloo, the RIFFLE might be a better tool.